Check out the latest Animal Jam Box Spoilers on My Subscription Addiction! Animal Jam Spring 2019 Box Spoiler #2! 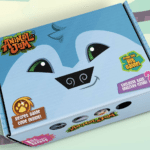 Animal Jam Spring 2019 Box Spoiler #1! Animal Jam Box Summer 2018 Theme Spoiler! Animal Jam Box Spring 2018 FULL Spoilers! Animal Jam Box Spring 2018 Spoiler #1! Animal Jam Box Winter 2017 FULL Spoilers! Animal Jam Box Fall 2017 FULL Spoilers! Animal Jam Box Fall 2017 Spoiler #1! Animal Jam Box Fall 2017 Theme Spoiler! Animal Jam Box Summer 2017 FULL Spoilers! "Aww, that so sweet. They do like like sparkly Easter eggs :)"
"This is exactly it. I already subscribe to beauty boxes so it was easy for me to go...but I already have eye ser..."
"It's a good gift with sub BUT that toast-for-the-host box is almost 1.5yrs old. I don't think BB has bought 'new..."